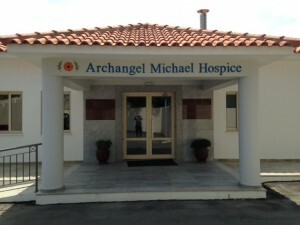 As a law firm in Paphos we come across many people, businesses and institutions in our day to day practice and, in our opinion, one of the very best community services available in Cyprus is the Archangel Michael Hospice in Paphos, which provides free medical assistance and comfort for those who are in need of palliative and respite care due to an incurable disease. To receive care the patient must be suffering from a terminal illness and may be either referred by their physician or self-referred. Respite care is also available for 2 – 3 weeks at a time to give family and care givers a rest and moral support. All those in need of palliative care (the relief and prevention of pain) are welcome, free of charge, at the hospice regardless of religious beliefs, nationality, age or the type of illness. The costs of the hospice are financed by donations, legacies and fund raising events. The aim of the hospice is holistic care – not only is the physical suffering addressed but also the emotional and spiritual needs of the patient, family and friends – compassionate care – helping the patient to retain quality of life as long as is possible and allowing the individual to die with dignity in a safe environment. The Archangel Michael Hospice is the only hospice on the island with rooms dedicated to the palliative care of children and emotional/spiritual support for their families. If you would like more information regarding the hospice or would like to host a fund raising event or make a donation please visit their website by clicking here. Ayias Marina 1, 8290 Mesa Chorio, Pafos, Cyprus. This entry was posted in services and tagged Cancer, Cyprus, Hospice in Cyprus, Palliative care, Paphos, Paphos Hospice on July 31, 2015 by LegalPaphos.